Geography is more than just maps, and there is substantial value in utilizing this science in your genealogy. Merriam-Webster defines geography as, "a science that deals with the description, distribution, and interaction of the diverse physical, biological and cultural features of the earth's surface." As our ancestors explored and settled on new lands, they would have certainly been confronted with geographical challenges: how to get over those mountains, where is the best place to ford that river? How deadly is Death Valley? Gaining insight into the region where your family was located may help you understand their lives and decisions in a more in-depth way. I have a thing for maps. Current maps, historic maps, political, road, recreational; it does not matter. Maps are fantastic tools, and they can truly be a remarkable asset to your genealogical research. Maps can teach you why your ancestor went across county - or state - lines to get married or conduct business. Maps can teach you about the general history of an area: how far away were they from Civil War battlefields, the construction of a major highway, or political border changes. One way in which you can explore the vast volumes of information on global geography is through National Geographic. The magazine itself is a wonderful resource, but there is another option. No longer do we need to collect piles of old copies, to be left in dusty corners for "future use." National Geographic has produced a series of CD-ROMs with all of their issues included from 1888 - 2009, titled "The Complete National Geographic." Available as a boxed set, this program quickly became one of my go-to resources for geographic research; it became my secret weapon. The set includes six CDs, divided by year, and allows you to flip page-by-page of every issue, including their famous maps. Searchable as well, this tool is an easy to use product that will truly allow you to understand the world as your ancestor's knew it. For example, finding Henry Gannett's article "The Movements of Our Population" in the 20 March 1893 issue could be hugely beneficial to those researching migration patterns through the United States (Vol. V, p. 21-44, CD 6). How Can Geography Help You? What is to gain by using geography in your research? A common example may be found in marriage records. Have you had trouble locating a marriage license or certificate? Take a look at a map that displays the topography of the land and the county borders for the time frame you need. Determine what obstacles might be in the way of your ancestor getting to the courthouse in their county, versus the courthouses in neighboring counties. Imagine yourself in that situation, and then find the easiest route out of the area to a courthouse. It may not even be the closest one, just the easiest one. As you explore the map, explore the record sets that become available to you from these neighboring communities. Did your ancestor disappear for a period of time, only to show up in an unexpected city several months or even years later? Examine the route they would have had to take to get from point A to point B. Even if they were physically closer to Boulder, Colorado, it may have been easier to go south to Colorado Springs. Take into consideration, also, the natural events and human progress that may have affected travel during that time frame. Were there severe tornadoes that year? Was it a winter of heavy snow fall? Was the route to Colorado Springs wagon worthy, when the road to Boulder was still just a pack trail? Using your imagination can open the research possibilities. Since much of my research time is focused on Colorado, I utilize the Geological Survey maps from the U.S. Department of the Interior quite a bit. Did you know that their topographic quadrangle maps include structures, abandoned airstrips and mining claims? 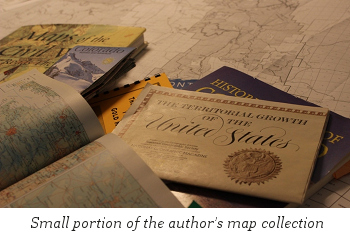 When people think of geography, they tend to lean towards maps, and for good reason. Maps can provide a wealth of information to the researcher, and there are numerous varieties to consider. The aforementioned National Geographic set and associated magazines have wonderful examples, including "The Territorial Growth of the United States" (Cartographic Division, National Geographic Society, Sept. 1987), which is one I've had in my collection since the issue arrived in my mailbox way back when. Each state also publishes their own "official map," usually each year. Typically included in tourism information, most of the state websites have order forms available online, and they send the map, along with other materials, to you in the mail for free upon request. Atlases are also a must have for your genealogy library, and it is often smart to include a copy for the country you research in, as well as the state or province. More unique sources may include historical atlases for your specific region, texts from a specific period of time, such as Maps of the Civil War: The Roads They Took by David Phillips (Barnes & Noble Publishing, Inc., 2005). A surprising source may be recreational guides, which can lead you, either by foot or vehicle, into the wilderness to explore historic sites. Two examples of this are the Motor Vehicle Use Maps provided by the U.S. Forest Service for each of their ranger districts, and The Summit Hiker and Ski Touring Guide by Mary Ellen Gilliland (Alpenrose Press, 2012). Both indicate historic sites along trails and 4x4 roads, and at times include photographs and historical summaries. Next time you stop at the bookstore, explore the travel area for guides in your region that may include historical sites that are pertinent to your research. Of course, online sources are available as well. Some popular options include the David Rumsey Map Collection, the United States Geological Survey (USGS) Libraries site, and the Getty Thesaurus of Geographic Names Online. Take a few minutes to explore each of these to see what they may offer for your area of interest. Spending just a bit of time to explore the world of geography could truly make a significant impact on your research and your family tree. Having a general understanding of local resources may just change your research plan altogether. You may find an entirely new route to your research goal!